Ahmadi, S., Davar, P., Manbohi, A. (2016). Adsorptive Removal of Reactive Orange 122 from Aqueous Solutions by Ionic Liquid Coated Fe3O4 Magnetic Nanoparticles as an Efficient Adsorbent. Iranian Journal of Chemistry and Chemical Engineering (IJCCE), 35(1), 63-73. Seyyed Hamid Ahmadi; Parastoo Davar; Ahmad Manbohi. "Adsorptive Removal of Reactive Orange 122 from Aqueous Solutions by Ionic Liquid Coated Fe3O4 Magnetic Nanoparticles as an Efficient Adsorbent". Iranian Journal of Chemistry and Chemical Engineering (IJCCE), 35, 1, 2016, 63-73. Ahmadi, S., Davar, P., Manbohi, A. (2016). 'Adsorptive Removal of Reactive Orange 122 from Aqueous Solutions by Ionic Liquid Coated Fe3O4 Magnetic Nanoparticles as an Efficient Adsorbent', Iranian Journal of Chemistry and Chemical Engineering (IJCCE), 35(1), pp. 63-73. Ahmadi, S., Davar, P., Manbohi, A. Adsorptive Removal of Reactive Orange 122 from Aqueous Solutions by Ionic Liquid Coated Fe3O4 Magnetic Nanoparticles as an Efficient Adsorbent. 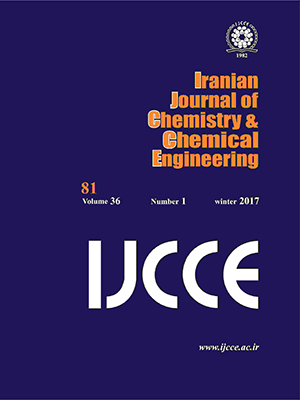 Iranian Journal of Chemistry and Chemical Engineering (IJCCE), 2016; 35(1): 63-73. In the present investigation, a novel adsorbent, ionic liquid modified magnetic nanoparticles (IL-Fe3O4), was successfully synthesized and characterized by FT-IR spectroscopy, ThermoGravimetric Analysis (TGA), XRD analysis, Scanning Electron Microscopy (SEM) and theory of Brunauer, Emmett, and Teller (BET) for removal of Reactive Orange 122 (RO-122) from aqueous solutions. The effects of various experimental parameters such as pH, contact time, nanoparticle dosage and ionic liquid amount were studied and optimized. Experimental results indicated that the IL-Fe3O4 nanoparticles had removed more than 98% of proposed dye under the optimum conditions. Detection and quantification limits of the proposed method were 14 and 46µg/L, respectively. Desorption process of the adsorbed dye was also investigated using methanol, ethanol and propanol as the solvent. Both the adsorption and desorption of dye were quite fast. The adsorption process preferably followed the Freundlich isotherm and pseudo-second-order kinetic model. The RO-122 was removed successfully from environmental water samples too. Parham H., Zargar B., Heidari Z., Hatamie A., Magnetic Solid-Phase Extraction of Rose Bengal Using Iron Oxide Nanoparticles Modified with Cetyltrimethylammonium Bromide, Journal of the Iranian Chemical Society, 8: 9-16 (2011). Zhang W., Yang H., Dong L., Yan H., Li H., Jiang Z., Kan X., Li A., Cheng R., Efficient Removal of Both Cationic and Anionic Dyes from Aqueous Solutions Using A Novel Amphoteric Straw-Based Adsorbent, Carbohydrate Polymers, 90: 887-893 ( 2012). Afkhami A., Saber-Tehrani M., Bagheri H., Modified Maghemite Nanoparticles as an Efficient Adsorbent for Removing Some Cationic Dyes from Aqueous Solution, Desalination, 263: 240-248 (2010). Golder A., Hridaya N., Samanta A., Ray S., Electrocoagulation of Methylene Blue and Eosin Yellowish Using Mild Steel Electrodes, Journal of Hazardous Material, 127: 134- (2005). Daraei, A., Treatment of Textile Wastewater with Organoclay, Iranian Journal of Chemistry and Chemical Engineering (IJCCE), 32: 67-70(2013). Afkhami A., Madrakian T., Amini A., Karimi Z., Effect of the Impregnation of Carbon Cloth with Ethylenediaminetetraacetic Acid on Its Adsorption Capacity for the Adsorption of Several Metal Ions, Journal of Hazardous Material, 150: 408-412 (2008). Samarghandi MR., Zarrabi M., Noori Sepehr M., Panahi R., Foroghi M., Removal of Acid Red 14 by Pumice Stone as a Low Cost Adsorbent: Kinetic and Equilibrium Study, Iranian Journal of Chemistry and Chemical Engineering (IJCCE), 31: 19-27(2012). Ishaq M., Saeed K., Ahmad I., Sultan S., Akhtar S., Coal Ash as a Low Cost Adsorbent for the Removal of Xylenol Orange from Aqueous Solution, Iranian Journal of Chemistry and Chemical Engineering (IJCCE), 33: 53-58 (2014). Chang YC., Chen DH., Adsorption Kinetics and Thermodynamics of Acid Dyes on A Carboxymethylated Chitosan‐Conjugated Magnetic Nano‐Adsorbent, Macromolecular Bioscience, 5: 254-261 (2005). Faraji M., Yamini Y., Rezaee M., Magnetic Nanoparticles: Synthesis, Stabilization, Functionalization, Characterization, and Applications, Journal of the Iranian Chemical Society, 7: 1-37 (2010). Lu AH., Salabas EeL., Schüth F., Magnetic Nanoparticles: Synthesis, Protection, Functionalization, and Application, Angewandte Chemie International Edition, 46: 1222- (2007). Kaur S., Gaur A., Structural and Photoluminescence Study of Iron Oxide Nanoparticles, Advanced Science Letters,20: 1707-1709(2014). Takafuji M., Ide S., Ihara H., Xu Z., Preparation of Poly (1-vinylimidazole)-grafted Magnetic Nanoparticles and their Application for Removal of Metal Ions, Chemistry of Materials, 16: 1977- (2004). Racles C., Iacob M., Butnaru M., Sacarescu L., Cazacu, M., Aqueous Dispersion of Metal Oxide Nanoparticles, Using Siloxane Surfactants, Colloids and Surfaces A: Physicochemical and Engineering Aspects 448: 160-168 (2014). Zhang C., Shan C., Jin, Y., Tong, M., Enhanced Removal of Trace Arsenate by Magnetic Nanoparticles Modified with Arginine and lysine, Chemical Engineering Journal 254: 340-348 (2014). Zhang Q., Yang F., Tang F., Zeng K., Wu K., Cai Q., Yao S., Ionic Liquid-Coated Fe3O4 Magnetic Nanoparticles as an Adsorbent of Mixed Hemimicelles Solid-Phase Extraction for Preconcentration of Polycyclic Aromatic Hydrocarbons in Environmental Samples, Analyst, 135: 2426-2433 (2010). Galán-Cano F., del Carmen Alcudia-León M., Lucena R., Cárdenas S., Valcárcel M., Ionic Liquid Coated Magnetic Nanoparticles for the Gas Chromatography/Mass Spectrometric Determination of Polycyclic Aromatic Hydrocarbons in Waters, Journal of Chromatogrphy A, 1300: 134-140 (2013). Vidal L., Riekkola M. L., Canals A., Ionic Liquid-Modified Materials for Solid-Phase Extraction and Separation: A review, Analytica Chimica Acta, 715: 19-41 (2012). Berthod A., Ruiz-Angel M., Carda-Broch S., Ionic Liquids in Separation Techniques, Journal of Chromatography A, 1184: 6-18 (2008). Mandel, K., Hutter F., Gellermann C., Sextl G., Synthesis and Stabilisation of Superparamagnetic Iron Oxide Nanoparticle Dispersions, Colloids and Surfaces A: Physicochemical and Engineering Aspects,390:173-178 (2011). Zargar B., Parham H., Hatamie A., Fast Removal and Recovery of Amaranth by Modified Iron Oxide Magnetic Nanoparticles, Chemosphere, 76, 554-557 (2009). Shariati S., Faraji M., Yamini Y., Rajabi AA., Fe3O4 Magnetic Nanoparticles Modified with Sodium Dodecyl Sulfate for Removal of Safranin O Dye from Aqueous Solutions, Desalination, 270:160-165 (2011). Afkhami A., Moosavi R., Adsorptive Removal of Congo Red, a Carcinogenic Textile Dye, from Aqueous Solutions by Maghemite Nanoparticles, Journal of Hazardous Material, 174: 398-403 (2010). Faghihian H., Rasekh M., Removal of Chromate from Aqueous Solution by a Novel Clinoptilolite-Polyaniline Composite, Iranian Journal of Chemistry and Chemical Engineering (IJCCE), 33(1): 45-51 (2014).